Almost one year ago to the day today, you would've found me sitting outside at a cafe in Venice, footsteps away from Piazza San Marco, alongside one of the city's legion canals, eating the most amazing gnocchi and pesto cream sauce. Ever. 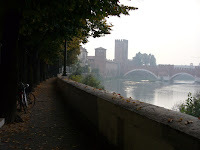 We lived en plein air in Venice before moving on to Florence, Verona and a handful of delightful small Italians towns. We could've stayed in Venice forever. Today, it's grey and toe-curling cold in Bermtopia after three nights with lows in the high teens. There's a slight threat of snow and sleet in the morning. The conversation about our next trip has begun in earnest. The decision-making is almost paralyzing with potential. 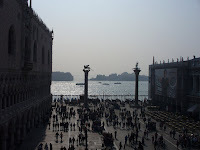 Do we go back to Venice because you will never, EVER see the same Venice no matter how many times you visit? Do we explore Spain because a six-hour layover in Madrid made us wish for 60 more? Do we golf in Ireland? Back to the beaches and howler monkeys of Costa Rica? Ahhhh, as soon as we say oh-so-definitely -- "Let's go back to...." -- a new map or word of mouth sets us off on the possibility of a whole new adventure. The conversation has indeed begun in earnest.